Grind these three ingredients in mixture,add little water if required. Heat oil in a pan,splutter jeera.Add Asefetida. Put the coriander power,turmeric powder and red chilly powder.Cook it for 5 mins in medium flame. Tomato mixture will start leaving oil in edges. Mixture will reduce to half in quantity. Now add the chopped spinach,(Can be pureed)add little of boiled chana water or regular water for gravy consistancy. Cover it with lid and cook for 3-5 mins. 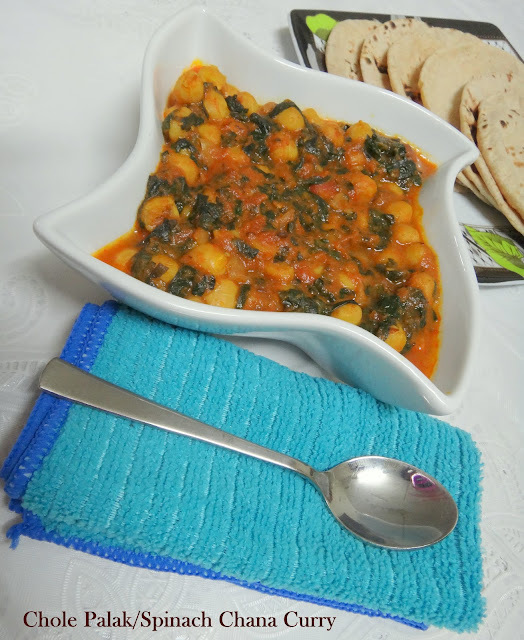 Once spinach turn little mushy and well cooked add garam masala on top.Mix well. That's it Simple and healthy Curry/Sabzi 's ready to serve!! Linking this healthy recipe to "Blog Hop Wednesday" -"Let's Cook#13~Greens "and Sangeetha's ,"Show me your hits~Fiber Rich Foods"..
love the preparation, perfect with rotis..
Love this combination, very nicely done..
Curry looks picture perfect Prabha. Wonderful combo as well. 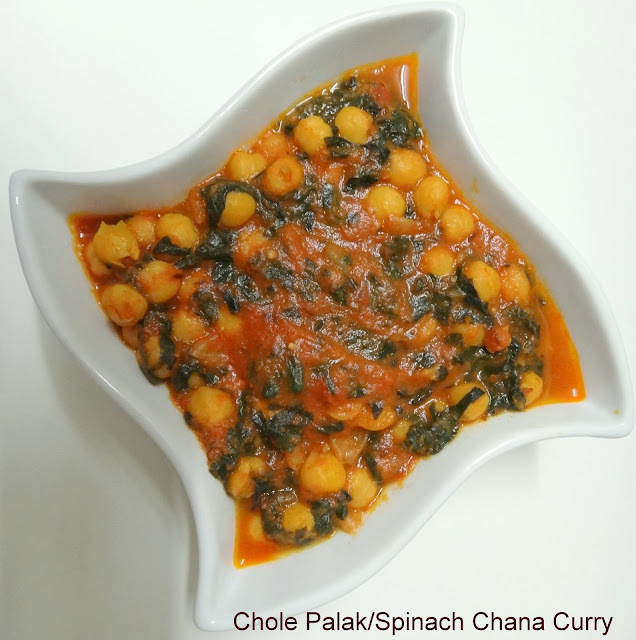 Chole palak looks healthy and yummy. wholeosme and yummy curry...lovely combo...looks more inviting! thank you so much for linking to the event,.. I love chole. Adding spinach is a healthy way to have it. Looks perfect with rotis. chole with spinach really new for me. but i loved this recipe. Very healthy and yummy combo curry. I love this. I have left an award for you. Please collect it at my blog.